Sunday roasts are something which I haven’t quite come to grips with. As an American, it’s not something I grew up with, so the idea was a bit foreign to me from the start. I love roasted meat, but I can’t say I was ever impressed with the bland steamed or boiled vegetables that sit alongside it only to be drowned in gravy which is quite often made from granules. Plus, who needs cabbage, carrots, broccoli, cauliflower cheese, Yorkshire puddings, pigs in blankets, stuffing balls (really?) and roast potatoes – and they say Americans serve up big portions! I love vegetables, but I don’t need the whole allotment on my plate. Despite all that, I have come to love the tradition of making a special meal on a Sunday afternoon and enjoying it with a nice bottle of wine. I’ve simply cut out the bits that don’t excite me and replaced them with things that do. We try to do Sunday ‘roasts’ with a twist by using unusual flavor combinations or cooking the meat in new ways, hence the inverted commas; it does not always involve roasting per se. This Sunday I wanted to try something restaurant-y, so I tried to think of a combination of vegetables which would go well with thyme and chicken. I came up with Jerusalem artichokes, butternut squash, beets and spinach. All of the ingredients are earthy and deep in flavor, plus there is a pleasant mix of colors: white, orange, deep red and green. I had an idea of what it would look like on the plate, but I’m no Michelin-starred chef, so I couldn’t quite translate that to reality. Still, it looked edible and wasn’t completely stone cold by the time we got around to eating it. We enjoyed it with a beautiful bottle of Bouchard Aîné & Fils Pinot Noir (2011) which I got from Sainsbury’s – I don’t know if it is made specifically for Sainsbury’s, but I can’t find it on the Bouchard Aîné & Fils website. I will have to buy another bottle and write a wine note for it because it just blew me away. It went extremely well with the earthy flavors of all the ingredients and was wonderfully rounded and fruity. It was slightly reminiscent of a Californian red – which, being from California, I am quite partial to – being heavy on red fruit with a hint of vanilla and no lingering bitterness or harsh tannins. It was one of the best red wines I’ve had in a while and it rounded off a lovely afternoon – meaning it made me forget I had just spent two hours sweating in the kitchen while my husband laid on the couch coming in periodically to grab another beer. It was a delicious meal, but boy was it a lot of work! So much so that I couldn’t even take pictures of the different stages, so I apologize for this post being a bit photo-deprived. My method is below, but rest assured there are much simpler recipes to come this week! The night before, I roasted three beets by drizzling them with olive oil, salt and pepper and wrapping them individually in foil and putting them in the oven at 160°C for about an hour and a half. I left them in the foil overnight and peeled them the next day, then cut them into cubes. For the butternut squash I only needed the neck end, so I’ll use the rest for something else, maybe Laksa! I peeled and diced it into similar cubes to the beets – I didn’t take any account for shrinkage, so the squash cubes ended up being much smaller than the beet cubes in the end. I then put the cubes into a small stock pan with some sprigs of thyme, salt and pepper and covered with water. I simmered them for about 20 minutes which was a bit too long because they were quite soft when I removed them. Probably 10-15 minutes would have been long enough as you want them to keep their shape for when you pan fry them later. The Jerusalem artichokes, or sunchokes, were peeled, sliced and poached in a bit of milk with a few more sprigs of thyme, a knob of butter, salt and white pepper. After about 10 minutes I pureed them in the food processor with the cooking milk. I added a squeeze of lemon at the end, but it was still missing something. If anyone could give me ideas of what to add I’m open to suggestions. I see now that the Mark Sargeant recipe says to add some of the cooking liquor from the chicken, but I think this would have made it too runny although the flavor would have been lovely. His puree was meant for adding to a risotto, so I wasn’t after the same consistency. 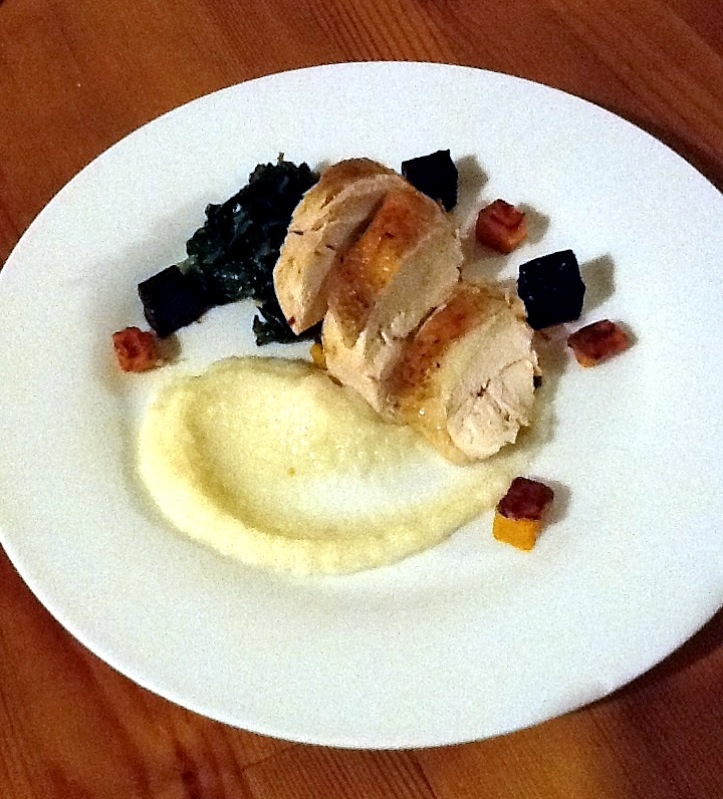 I found this recipe from Mark Sargeant which I decided to use as the basis for the chicken. I removed the legs and wings from a medium size chicken, seasoned it inside and out and stuffed a few sprigs of time and a bulb of garlic inside. I then put this in a pot with two liters of water and a couple chicken stock cubes. I brought it to the boil and then reduced it to a low simmer, poached it for 25 minutes, took it off the heat and let it cool in the stock. I removed the chicken breasts from the bone and put the carcass back into the stock. I plan on making some chicken soup with the stock – which is absolutely delicious! – legs and wings. Then I fried the breasts in a couple tablespoons of olive oil, skin side down, for about 10 minutes. Then I set them aside and covered with foil to rest while I got everything together. I pan fried the butternut squash in olive oil, with a few thyme sprigs thrown in whole and a crushed garlic clove (I added the garlic clove to the artichoke puree later), until they were golden on both sides which took about 3 minutes each side. I put the beets in a small frying pan with about 3 tablespoons of balsamic vinegar and a small amount of the chicken stock and let it reduce to a syrupy glaze. It took about 5 minutes. To the pan with the chicken juices and olive oil I added a knob of butter and the roughly chopped spinach and just wilted that adding a ladle of the chicken stock and letting it reduce. The whole process took probably 2 hours, not including roasting the beets the night before, and I was knackered by the time it was done – I’m obviously really out of shape. It was a bit of a rush to try and get everything together at the last minute, but if I have a culinary weakness it is time management. I would welcome suggestions of other twists on the classic Sunday roast or advice on how to manage my time better in the kitchen! Your husband will by CRYING in his beer when you win the James Beard award while he is laying on the couch.